Brief nature of mars: Mars, a powerful planet, can work out miracles for it's devotees. It can protect it's devotees from impending dangers and blood-related ailments. It is instrumental in the acquisition of landed properties, acquiring of status, affluence in profession/occupation and even relieves from steep debts. In Vedic astrology Mars is know as MANGAL, ANGARAKA and KUJA. These names in Sanskrit mean, "auspicious, burning coal, and the fair one". Mars is a malefic. Mars Ruling Signs: He rules over the two sidereal signs of Aries (Mesh) and Scorpio (Vrishchik). Mars exalted and debilitated Rashi(s): He is exalted in Capricorn (Makra) and fallen in the opposite sign of Cancer (Karka). Mars is often depicted as a god with a red body exemplifying the natural color of the astronomical body in the sky. Mars signifier: Kuja is a karaka, or indicator, of brother and siblings, assertion, aggressiveness, soldiers and military endeavors, mechanical ability, engineers and surgeons, commanders and rulers, accidents, violence and war, ambition, strength, arguments and conflict, passion and desire. Like Surya, the Sun, Mars most powerful position is in the 10th House. 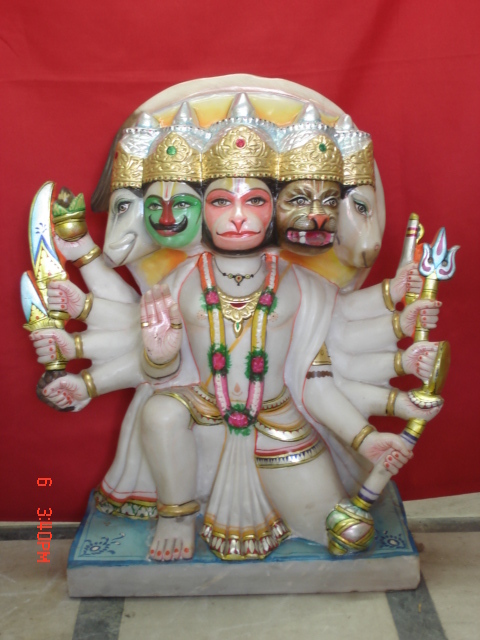 He is a particularly beneficial planet for Cancer or Leo Ascendants. His nature is PITTA, or fiery. His gem is red coral and his direction is south. Mars' day is Tuesday and he reaches full maturity at age 28. In Vedic mythology Mars appears to have been born of the Earth. SARVA, the archer, represents the element of Earth as the supporter of life. Sarva's wife VIKESI, the disheveled, is the Earth goddess. The Puranic literature of ancient India declares that Angaraka, Mars is their son born of the Earth. 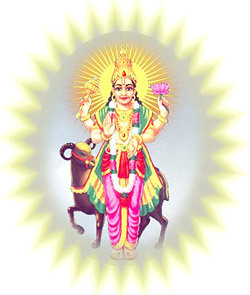 Mars sun of Shiva and Lord Of War: Mars is further identified with the Kartikeya, the god of war. He is the son of the god Shiva, who was born without Shiva's union with a woman. Kartikeya was born with six heads as the six goddesses of the lunar constellation, Kritika, or the Pleiades nurtured him. Kartikeya kills the seemingly invincible demon Taraka, and releases the Devas from Taraka's oppression. These myths depict valor, strength and courage, and most fittingly, the protective quality of Mars. Thus, Mars is known as the protector of dharma, the sacred path and purpose in life that each of us follows. In the Zodiac, ANGARAKA or MARS is regarded as a God of martial character, red in every aspect. Even the Romans held him as their Guru. In the Zodiac, He is the Lord of "Mesha" and "Vrischika". He stays 1 1/2 months in each Rasi taking 18 months to complete the cycle. Mars heroic planet: Mars is a masculine, dry, and fiery planet. It is said to be the commander-in-chief of the assembly of the nine planets. It is also personified as the god of war. Mars is a warrior by nature-bile-dominated in temperament – and it rules over courage, bravery, patience, self-confidence, leadership abilities, physical strength, forcefulness, violence, animal nature, cattle, land as property, earth, fire, saffron, musk, mercury (the metal), cuts, burns, bruises, anger, hatred, impulsive nature, and insensitivity. Mars makes its natives short-tempered, argumentative; lovers of weapons, guns, and explosives; commanders; generals; soldiers; and policeman. It also gives them great technical and mechanical abilities and makes them builders, designers, engineers, and good surgeons. Mars Diseases: It causes eczema, rashes, disorders of the blood and bile, cuts, wounds, electric shocks, gunshots, knife wounds, burns, bruises, anger, hatred, psychic disturbances, poverty, infections, smallpox, plague, tuberculosis, thirst, piles, ulcers, fevers, poisoning, surgical operations, and diseases of the stomach, liver, lungs, nose, and ears. Mars Nakshatras: It is powerful in Pisces and Aquarius, Mrighshira, Dhanishtha, and Chitra and its nakshatras. Mars worship significance: A prayer to this planet frees one from debts, poverty and illness afflicting the skin. This graha bestows property and conveyance (Locomotion). A prayer to Angaraka can restore loss of eyesight. Tuesdays are intended for the worship of Angaraka who loves the chanting of Sama Veda. If one observes the fast on Tuesday for 21 times, the unlucky influence of Tuesday (Mangal) can be got rid off. The legend that depict the influence of the worship of MANGAL goes as follows, and is narrated whenever a worship or offering is made to the deity. Mars story: An old woman used to observe fast on every Tuesday. Her son was named Mangaliya. Mangal deity in disguise of a Brahmin came and asked her "I am hungry. I shall prepare my own food but you plaster the ground with cow-dung." The woman said, "Today is a Tuesday; I do not plaster cow-dung on this day. I shall sprinkle water and you can prepare food." The Brahmin said, "I shall only cook on a cow-dung plastered surface." The woman refused and said that she could do anything else except cow-dung plaster." The Brahmin said, "Let your son lie upside down, I shall cook on his back." After some thought, the woman agreed to this and called her son. The disguised Brahmin lit the furnace on his back and cooked food. After cooking, the Brahmin asked the woman to call her son so that he could take the auspicious food. The woman, in grief, said why he cut jokes and that after your cooking on his back, he would have died. The Brahmin explained and insisted her to call the son. When insisted the woman called, and the son came running. The Brahmin said, "Old woman, your fast is successful. With kindness, your mind is also full of devotion and faith. May you be ever happy." The deity (Mangal) in disguise disappeared.